Type of music: A wide variety of musical styles. 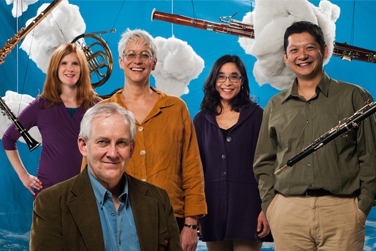 Halifax-based Fifth Wind is a woodwind quintet whose genuine enjoyment of their intimate musical connection has inspired many adventurous collaborations and educational initiatives. United in their commitment to both embrace the traditions of the woodwind quintet genre and break new ground by commissioning works, founding members Jack Chen (flute), Suzanne Lemieux (oboe), Eileen Walsh (clarinet), Ivor Rothwell (bassoon), and Mary Lee (horn) are established musicians in the Canadian music scene whose love of chamber music is contagious and inspiring. Fifth Wind has performed extensively throughout the Maritimes, on professional Chamber series and in schools and universities. Their collaborators have included storytellers, choral and wind ensembles, a DJ, a harpist, participatory audience, and even an owl! Their interest in encouraging the growth of the wind quintet repertoire has led them to nurture young composers from high school through university, and as the recipients of a prestigious Canada Council New Chapters grant, they have spearheaded five new commissions from composers across Canada, premiered by five Canadian woodwind quintets in 2018. Recent highlights include appearances on the Music Room Chamber Series and Open Waters Festival, as well as intensive collaboration with Nova Scotian composer Emily Doolittle as part of their New Chapter “Forecasting the Canadian Wind” project, and many appearances in schools. Fifth Wind is available for hire for recitals, children’s concerts, collaborations, school concerts, and clinics.